The Intellical™ Nitrate ISE Analysis Package contains all you need to start measuring nitrate (NO3-) with your HQD meter instrument: The Intellical™ ISENO3181 Nitrate ISE with 1 m cable, 500 mL bottles of 1 mg/L, 10 mg/L and 100 mg/L of Hach nitrogen-nitrate standard solutions, pack of 100 Hach nitrate ionic strength adjustor (ISA) Powder Pillows. *Utilizes a unique solid-state sensor technology that eliminates costly membrane replacements. Utilizes a unique solid-state sensor technology that eliminates costly membrane replacements. Traditional PVC-membrane ISEs require membrane replacement every 2-3 months. The IntelliCAL ISENO3181 Nitrate ISE’s unique solid-state sensor technology eliminates the need for frequent membrane replacement by using a solid gel ion exchange behind the ion-selective membrane versus the liquid ion exchange used in most ISEs. This design allows users to get up to 2 years of life from their ISE without membrane replacement – saving the time and costly expense of frequently exchanging membranes. 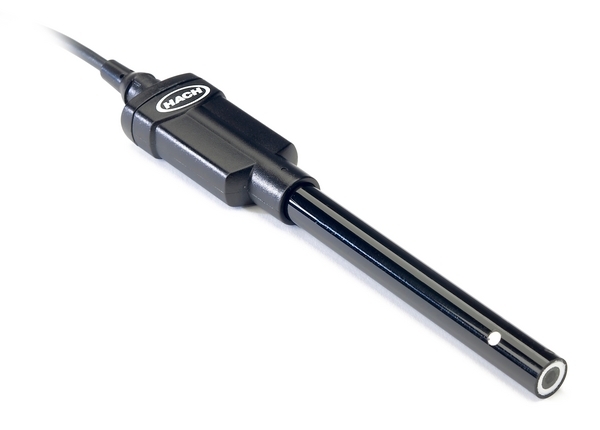 The solid-state sensor design allows for DRY storage of the ISE without a shelf life. Also, the probe does not require the electrolyte to be refilled or membrane replacement. IntelliCAL digital probes lock on the result when the measurement is stable, removing the guesswork in having a moving number. Additionally, the probe’s large annular reference junction provides maximum surface area between sample and reference electrolyte for fast measurement stability. And the solid-state sensor design doesn’t allow the membrane to flex or undergo surface area changes, leading to more stability in results over a variety of samples.